Shakshouka is a Middle Eastern dish where eggs are poached in a warming spicy tomato and pepper sauce. This dish has gained a lot of popularity around the world and over here too, with many variations to choose from. It is a great brunch dish and is ideal for sharing, it has so much flavor going on it really is a full meal in its self so definitely not just restricted to breakfast or brunch alone. 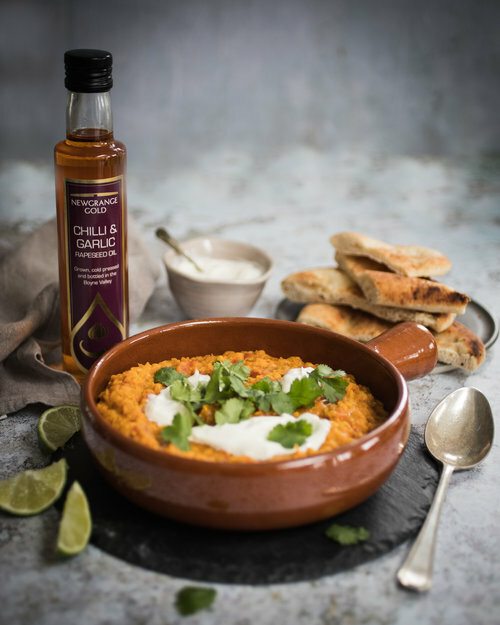 By using this recipe with the addition of our Newgrange Gold Smokey Rapeseed Oil you can bring the flavors of this dish to a whole new level, the added depth of smokiness our oil gives complements the rustic style of this dish so well. Don’t forget to serve with a large hunk of toasted bread which will allow you to mop up every last drop of this flavorful sauce. Prepare your onions and garlic, slice and deseed the red peppers. Then add your onions and a pinch of salt to saute for a few minutes until they have softened and become more translucent. Stirring occasionally so they don’t stick or turn brown. Add the garlic and spices; cumin, chilli flakes and the paprika. Cook for a minute and add the peppers and the thyme. Cook on a high heat, allowing the peppers to soften and get a nice colour. Add the tinned tomatoes, stirring and using the back of your wooden spoon or spatula to help break down the tomatoes and combine with the rest of the ingredients. Cooking together on a low heat for 10 to 15 minutes. Taste and adjust the seasoning, adding salt and pepper if needed. You can prepare until this point of the recipe in advance and reheat when needed before adding the eggs. Crack your for eggs into for separate small containers, a glass or mug would be perfect. This will help save time and make it easier when adding them to the mixture. Using the back of your spatula create four gaps like little wells for your eggs to slot into evenly around the pan. gently drop each egg slowing into the places that you have prepared for them. Pop on the lid and allow to cook on a low to medium heat for 10 to 15min. Sprinkle with fresh coriander and serve straight away with toasted bread.